Seated Liberty Wiki - Sheaffer Select Coins & Collectible. The Seated Liberty portrait designs appeared on most regular-issue silverUnited States coinage during the mid- and late-nineteenth century, from 1836 through 1891. 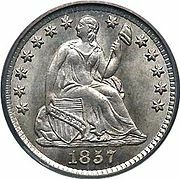 The denominations which featured the Goddess of Liberty in a Seated Liberty design included the half dime, the dime, the quarter, the half dollar, and until 1873 the silver dollar. Another coin that appeared exclusively in the Seated Liberty design was the twenty cent piece. This coin was produced from 1875 to 1878, and was discontinued because it looked very similar to the quarter. Seated Liberty coinage was minted at the main United States Mint in Philadelphia, as well as the branch mints in New Orleans, San Francisco, and Carson City. The basic obverse design of the Seated Liberty coinage consisted of the figure of the goddess Liberty clad in a flowing dress and seated upon a rock. In her left hand, she holds a Liberty polesurmounted by a Phrygian cap, which had been a pre-eminent symbol of freedom during the movement of Neoclassicism (and in fact traces its roots back to Ancient Greece and Rome). Although it had fallen out of favor in Europe by 1830, Neoclassicism remained in vogue in the United Statesuntil after the American Civil War. Liberty&apos;s right hand rested on the top corner of a striped shield with a diagonal banner inscribed with the word "LIBERTY." The shield represented preparedness in the defense of freedom. The date of the coin appeared on the bottom below Liberty. The basic reverse design of Seated Liberty coins depended on the denomination. The size of half dimes and dimes necessitated a smaller array of elements. On these coins, the reverse consistently featured a wreath around the words "HALF DIME" or "ONE DIME". Before 1860, this wreath consisted of laurel leaves, a traditional Neoclassical image, but beginning that year, the wreath was enlarged and was filled not only with leaves, but also traditional American agriculturalproducts, such as corn and wheat. On quarter, half dollars, and silver dollar coins, the reverse featured a central eagle about to take flight, with a striped shield upon its breast. The eagle clutched an olive branch of peace in its right talons and a group of arrows in its left talons. Above the eagle around the rim were the words "UNITED STATES OF AMERICA" and below the eagle around the rim lay the coin denomination. Beginning in 1866 the coins featured a ribbon with the motto "In God We Trust" above the eagle. The Seated Liberty coins featured a few minor design changes over the years. Around 1840 (the exact date depends upon the denomination), extra drapery was added to Liberty&apos;s left elbow. In 1853 and 1873, the U.S. Mintchanged the weight of each denomination of silver coins. Both times, arrows were added to the coins on each side of the date. These were removed from coins in 1856 and 1875, respectively. In 1853, the mint also placed rays around the eagle on the reverse of half dollars and quarters, a feature which endured for that one year only. Liberty Seated half dime with New Orleans mintmark. In 1860 the U.S. Mint eliminated the stars on the obverse of Seated Liberty half dimes and dimes, replacing them with the legend "UNITED STATES OF AMERICA," which had previously appeared around the wreath on the reverse of the coins. 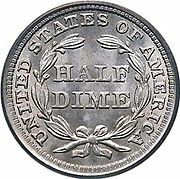 Before this time, half dimes and dimes minted in New Orleans and San Francisco had featured their mintmarks inside the wreaths. Afterwards, the "O" and "S" (and, later, the "CC" for Carson City) mintmarks were located below the wreath next to the rim. On quarters, half dollars, and silver dollars, the mintmarks were always placed below the eagle but above the coin currencyon the reverse. Many people collect seated coinage by variety. This can range from a repunched mintmark to the position of a date on the coin to a die crack at various stages. This type of collecting has been popular with Bust half dollars for well over 100 years. Seated coin collecting by variety has grown over the last 30 years with the formation of Liberty Seated Collectors Club. Liberty Seated Coin Chat room, visited by numerous experts. There is more Seated coin information here than anywhere in the world. Have a question? Ask the experts. Content is available under CC BY-SA 3.0unless otherwise noted.